Photo courtesy of Aaron D.
Well, at least he’ll be warm. He may be doing “porridge” in Dartmoor. CITE: do ˈporridge (British English, old-fashioned, informal) be in prison serving a sentence: He’s doing porridge again, this time for armed robbery.This comes from the fact that as porridge is a cheap food that makes the stomach feel full, it was often served in prisons. Dinna ye ken. Yer nae use milk, jus a wee dram o whisky. A person too poor to own a home may become cereal renter. 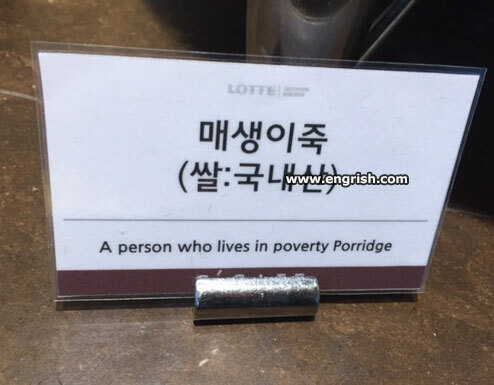 You were lucky to have porridge! There were a hundred and fifty of us living in t’ shoebox in t’ middle o’ road. Beats living with a bunch of fruit loops, I guess. For they among you who “kisim save long Tokpisin” this is bloody hilarious. I’ve heard that food served in USA prisons is especially horrible, and I got that from accounts of people who have been in prison. Not the porridge . . .
Rice gruel is so yesterday. It is gruel, to make little children eat porridge. Did you hear about the bloke who murdered Snap, Crackle, and Pop, the monkey from Coco Pops, and all the other animated a$$holes who inhabit our breakfast-time soggies. It appears like he was a cereal killer. The only thing I can imagine, living IN porridge, would be a weevil. So the force of weevil is alive and well. Life can be gruel sometimes. @ Long Tom: Just another part of the crooked system. @DnT 1759. Who said. “Crime does not pay”? I think any number of highly paid Judges, Barristers, and Lawyers , would attest to the fact….That it does handsomely. BTW. It may or may not surprise you, that the Govt. is privatising the Prisons in Aust. also. Not according to my “Copper” mates. BTW Do you know why they call ’em coppers. Copper = Cu + Not Trustworthy $hitez. Marum: So Dr Johnson was not being entirely forthright when he defined oats as “A grain that in England is fed to horses, but in Scotland to people”. Does living in a theme park planet count as poverty?